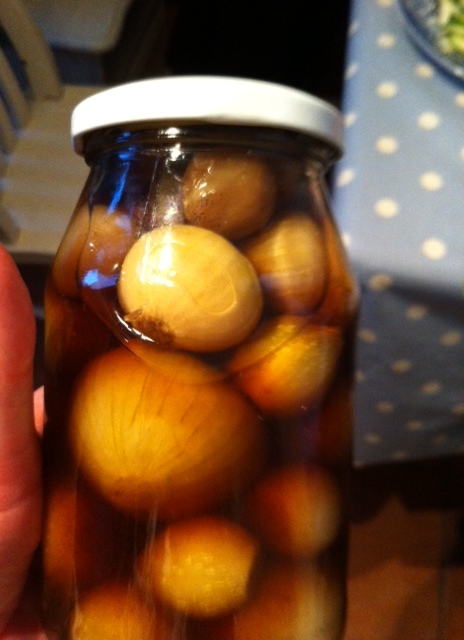 A wee while back Da gave us a jar of pickled onions! Becksie LOVES pickled onions, Ian is not that keen and for Lizzie the jury is still out! Now these little beauties came with a slight catch…….. they had an instruction that they weren’t to be opened until a certain date! 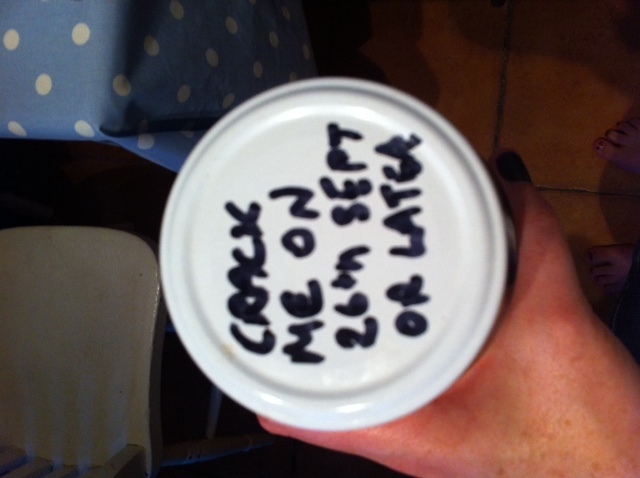 This was hard to come to terms with for Becksie the pickled onion lover. So…… she put them in the pantry and tried to ignore and deny their existence. Meanwhile in a different corner of the world Aunty Leah and Uncle Liam fellow pickled onion LOVERS also waited for their pickled onions to be ready! They are SO into pickled onions we kid you not they had actually marked their onion ready day on their calendar!! Here in Faringdon we settled down to a lazy tea of Jacket potatoes, cheese beans and salady bits and all of a sudden Becksie jumped up with delight as she remembered it was the 27th September and her pickled onion ready date was in fact yesterday! With excitement she ate about 8 in a row whilst Ian ate the smallest one possible after Lizzie had licked and rejected it! These pickled onions were lip tinglers!!!!! With utter excitement Becksie called Aunty Leah to remind her it was pickled onion day only to get a disappointed Aunty Leah who informed us that her pickled onion date is not for another 3 days! There is a word for that………. 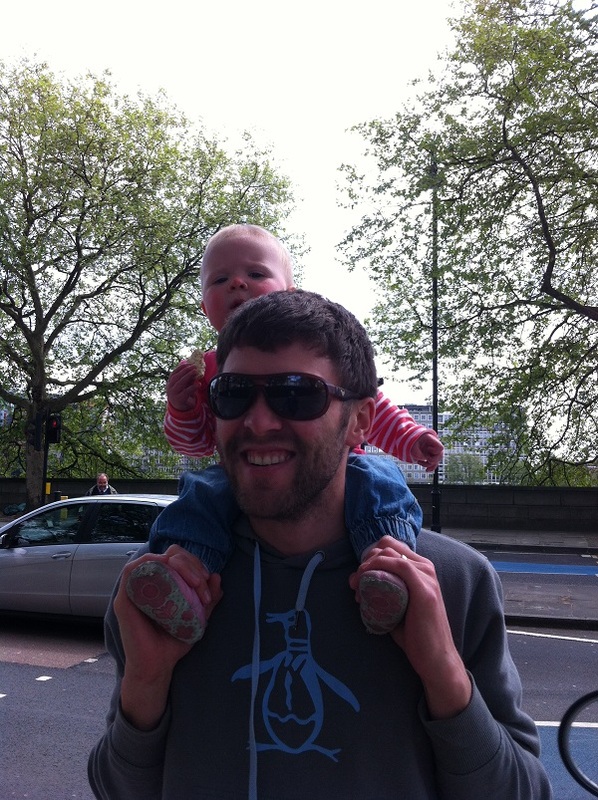 The lovely Uncle Liam has been having himself a bit of birthday action. 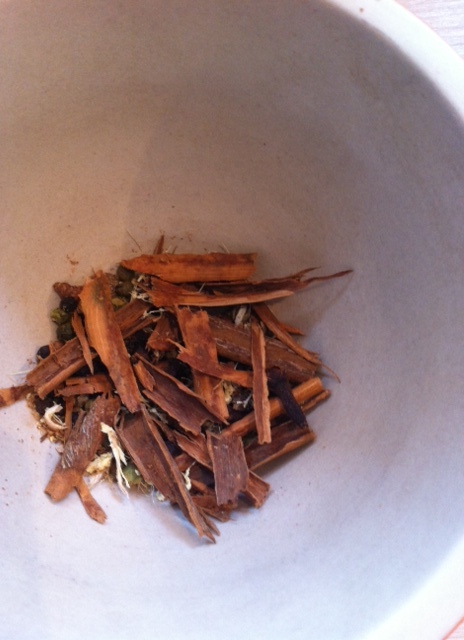 We wanted to post him a little homemade gift and as he loves tea we decided to make him some ‘Team Pugh’ Chai Tea. It was a) super easy and b) we were quite please with the results so……… you guessed it we thought we’d share the recipe with you. Take all of the ingredients except for the tea and lay them on a baking tray. Place in a hot oven for 5 minutes (this part smells delightful). Remove from the oven and allow to cool. Put the toasted ingredients in a pestle and mortar and crush! Add the chai to the tea. We put Uncle Liam’s in a box and posted and after trying a cup full made a second batch to keep. 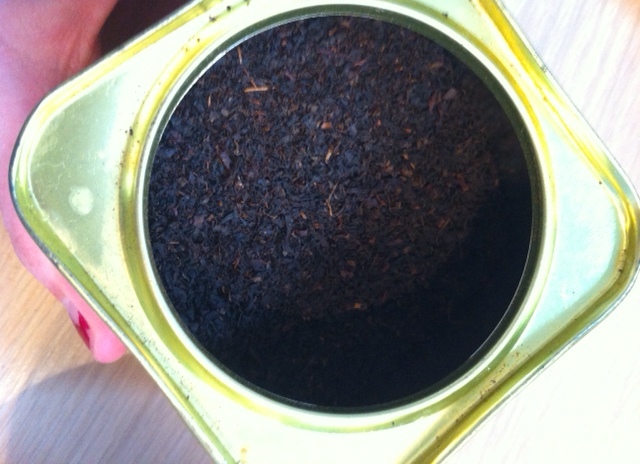 Use as you would normal loose tea in a teapot – serve with milk. 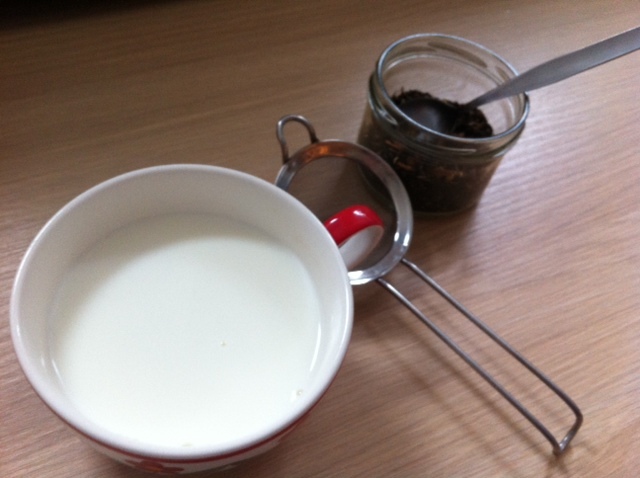 or…….. treat yourself to a chai latte – heat milk in a milk pan with the chai tea in. 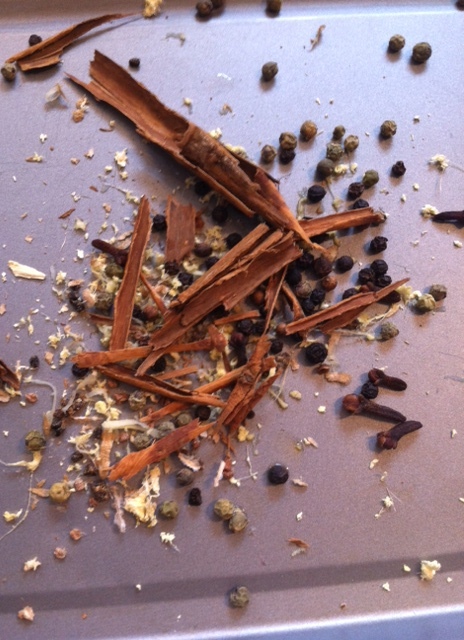 When heated strain through a tea strainer and sprinkle with cinnamon, delicious! Some of you may remember that it was recently Ian’s birthday, and one of his presents from Becksie was 2 tickets to a butchery masterclass at Millets Farm. Ian was uber excited. He has had a go at the odd bit of butchery, the odd deer, pheasant, pigeon and rabbit, and has picked up the bare bones (!) of butchery. That said, the meat always had a slightly hacked appearance, and although we all know the important thing is really how it tastes, not looks, it would be nice if he had a bit more of a clue exactly what he was doing and how to do it a bit quicker (the last deer took a combined total of about 6 hours). 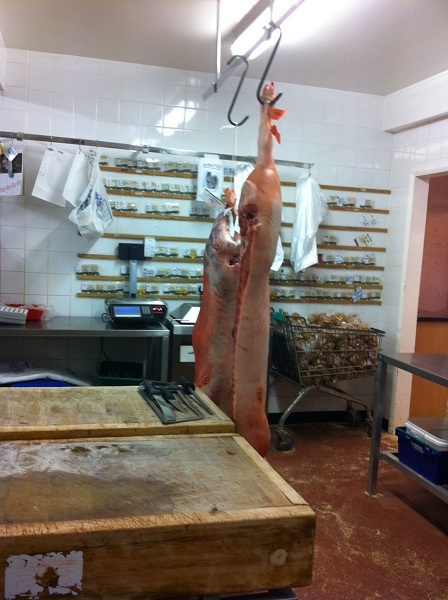 So off we went for a masterclass demonstration in how to butcher a lamb and a pig! The speed and skill of the proper butchers (with 70 years experience between them) was very impressive, and in no time at all the hung carcasses were turned into a fine display of meat ready for sale in the shop. Handy hints were garnered about how and where to cut and how to prepare various cuts of meat, how to de-bone and how to properly sharpen a knife! The butchers take a whole carcass, make joints and chops, and trim all of the rest of the meat off to use in sausages and burgers, no waste whatsoever! Even the bones get collected by a rescue centre for their dogs, amazing! No waste is what Team Pugh like. Having taken on a variety of animals Ian has flirted with the idea of buying a whole pig to butcher up himself, the advice on doing this from the people in the know? Don’t bother! Apparently it is not worth the hassle and you are paying for the head, bones and gristle that will just go to waste, and that it is almost as good value to buy it straight from the butcher. 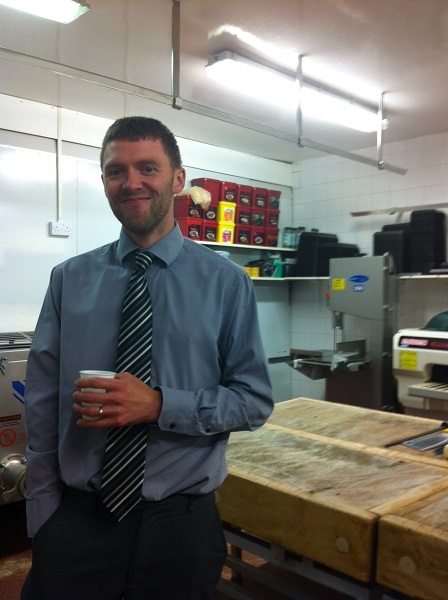 Now whether this is just a ploy to get people to buy their meat who knows, and having watched it being done properly Ian is even more tempted to give it a go…..
What was really interesting was that throughout the 2 hour course the topic of supermarket meat came up several times and………. 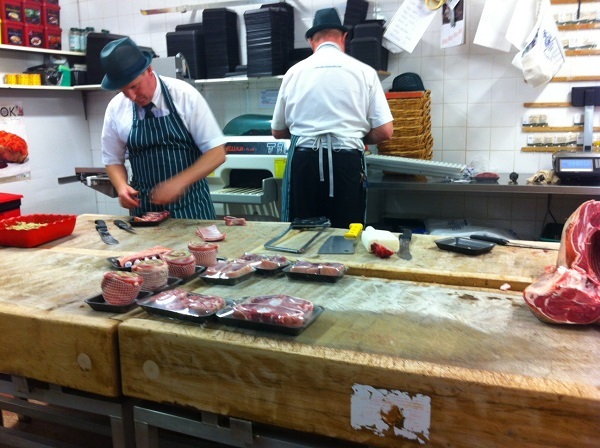 both butchers said they would not buy supermarket meat…….. intersting! 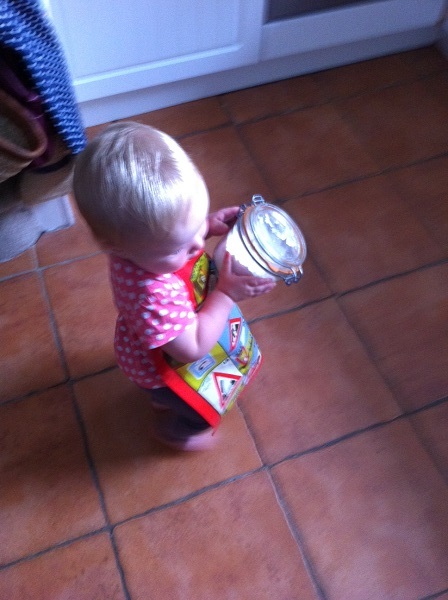 Today Lizzie has decided that its her turn to share a recipe. So…..Lizzie it’s over to you! 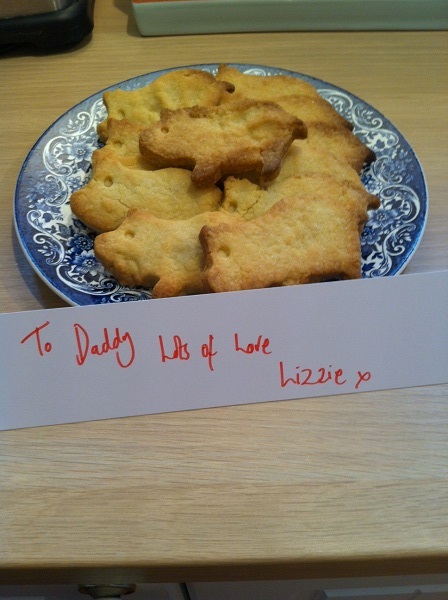 My Daddy loves biscuits, I love my Daddy so…. 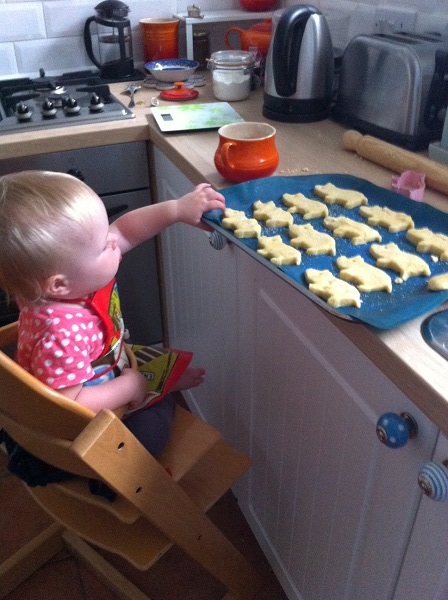 I decided to bake some biscuits for him. In order for my Mummy to not feel left out I decided to let her help. First things first I washed my teeny tiny hands. I then got my mummy to preheat the oven to 200c – Mummy is always telling me that the oven is hot and that I mustn’t touch it. Goodness me some of my toys are way more dangerous (have you ever dealt with stacky cups?) 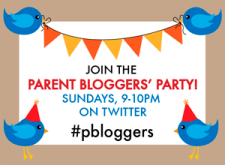 but I’ve learnt parents need humouring. Then it was time to put on my apron and get out the ingredients I required. 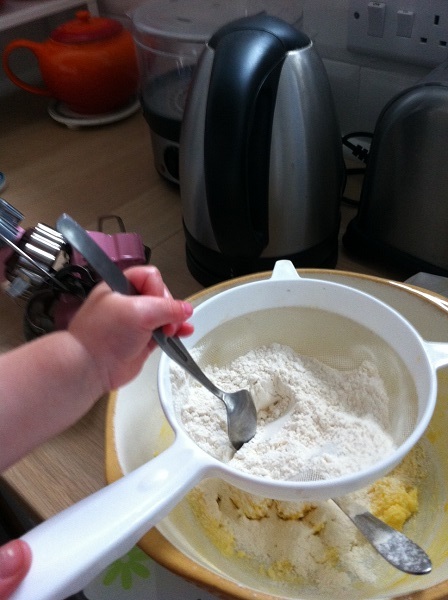 I fetched the flour, the sugar, an egg, the vanilla essence, the butter and the cornflour. It’s quite a long walk from our pantry to the worktop but I made it and even kept the egg in one piece. This is my concentrating face!! It was touch and go as mummy tried to take it off me before I got to the worktop but I was having none of this and said ‘no’ very firmly. I got Mummy to help me with the weighing out bit……. 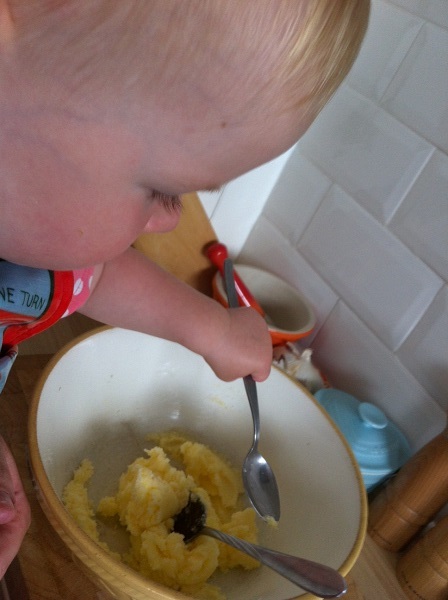 It was then time to mix it up – first mix the butter and sugar until combined. 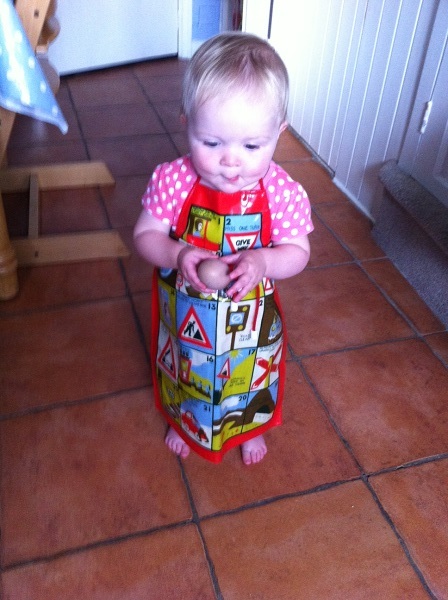 future career in quality control? I tried a bit it was YUMMY. 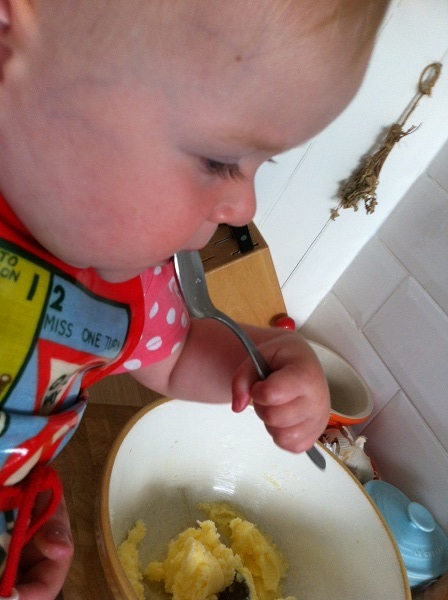 Truth be told I could have eaten the whole bowl but boring Mummy said no. I then added the vanilla essence and the egg yolk and mixed again. Then I sieved the flours and mixed it into the butter mixture. After a good mix we had a firm dough. 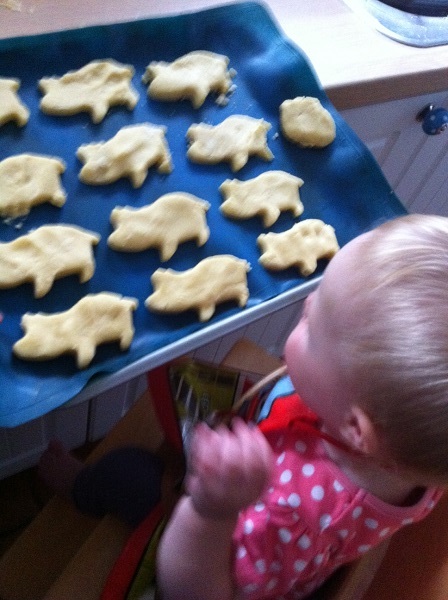 I chose the pig cutter and we rolled the biscuit dough to about 1cm and cut out our pigs. We put them on a baking sheet (we used a silicon sheet but a greased one would be grand as well). Made a mark for the eye, I added some finger prints and after eating a pigs leg (oops) and sprinkling with sugar we popped them in the oven for 22 minutes! When they were golden out they came and we waited for Daddy. He was very very pleased! Happy Fathers’ Day to you all! 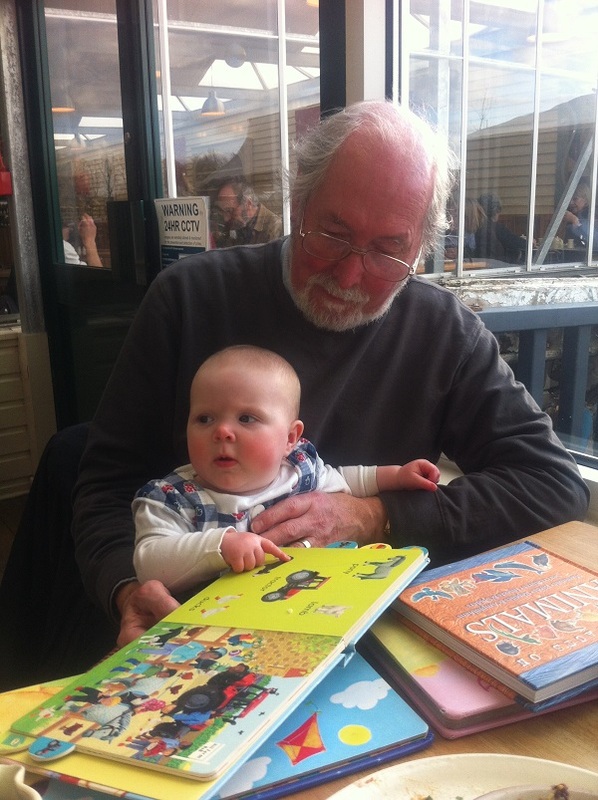 We are spending the day firstly with Grandpa Pugh. Then a bit of time as just Team Pugh. and then a stop off to see Grandad Gray in the evening. 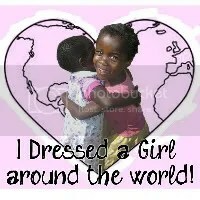 We hope that you all have a wonderful day however you spend it! 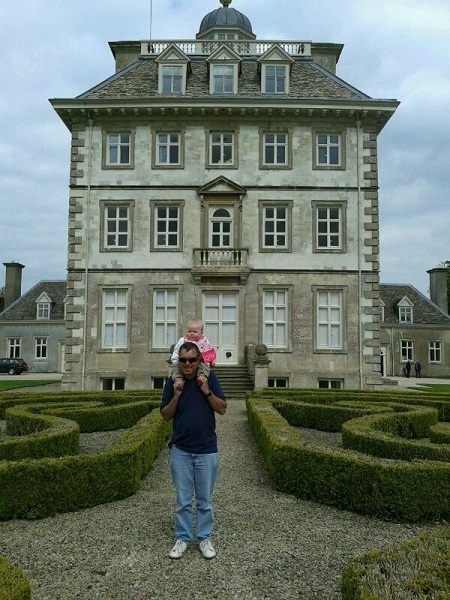 A blog exploring food culture and recipes.